When we think hiking, we think mountains. But a long walk on the Carolina coast’s hidden trails proves that the beach isn’t always for bumming. We beach for the luxury of being still. And for a few days, it is glorious. Then, we start looking for something else. Something to do. At this point, North Carolina affords a little-known beach indulgence called the coastal hike. Susan Levy of Cary was vacationing at Emerald Isle with her husband, Mike, when they discovered the Cedar Point Tideland Trail in the Croatan National Forest. They stepped onto the gravel pathway and skirted their way along a hardwood forest. Before long, they were veering into a lower-lying marsh, where a network of six boardwalks elevated them above hosts of fiddler crabs scrambling in the muck below. A mile later, the marsh evolved from an intimate creek into the mile-wide White Oak River before giving way to Bogue Sound near Swansboro. Wandering excluded, the Levys’ trip down the Tideland Trail loop was 1.4 miles — a shortcut shaves off a half-mile — along which the Levys saw what is, in many ways, a typical tidal marsh. There’s the usual sea oxeye, with its daisy-like yellow flower; the feathery spike grass; black needlerush and salt-marsh cordgrass, the grasses most commonly associated with tidal marshes; and glasswort, which bears a curious resemblance to asparagus. But the Levys also encountered the Tideland Trail’s wilder side. Because of how these high-marsh species collide with the adjoining forest’s ecosystem, there’s ongoing ecological change, writes ecologist and author Dirk Frankenberg in The Nature of North Carolina’s Southern Coast. For coastal hikers, that means strolling amid an exceptionally broad array of abnormal coastal plants. Like sea beans, for instance. Levy immediately recognized the plant from a grilled salmon seasoning she’d had with family in Oregon. “Now I know the real name is Salicornia!” Levy says. She was amazed to learn that sea beans actually grow here, in our salt marshes. Although not everything you’ll come across along the Tideland Trail is a culinary delicacy, Frankenberg awards the Cedar Point area of the Coastal Croatan five stars. It’s a five-star experience because you don’t observe it from afar, through a coin-operated telescope. 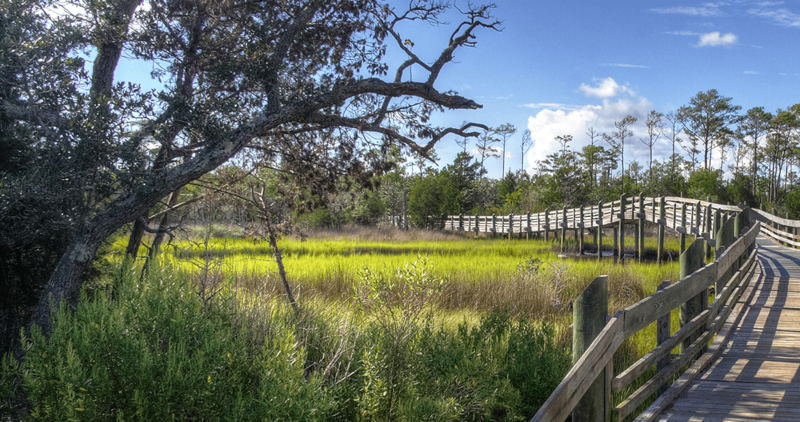 If you can peel yourself from that beach chair, the Cedar Point Tideland Trail promises a retreat into the heart of North Carolina’s offshore action. Joe Miller writes the health, fitness, and outdoor adventure blog GetGoingNC.com.